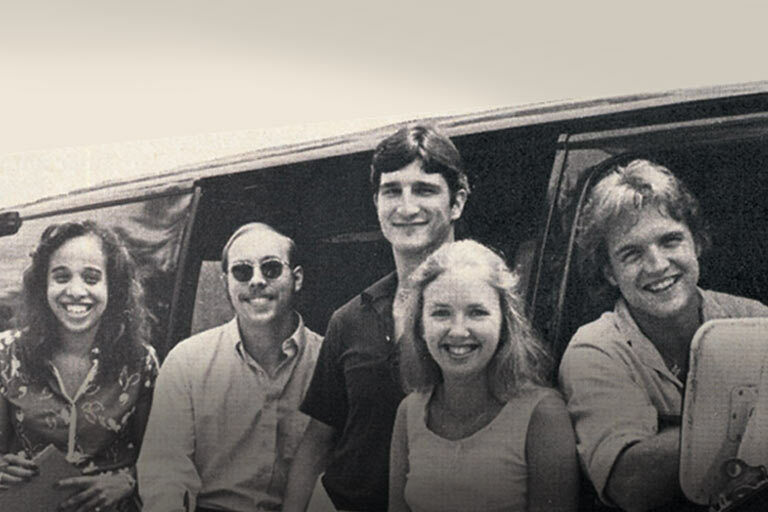 I can still remember when CD players were new technology — how deeply I coveted a machine that could do justice to every sublime note of the music I loved. 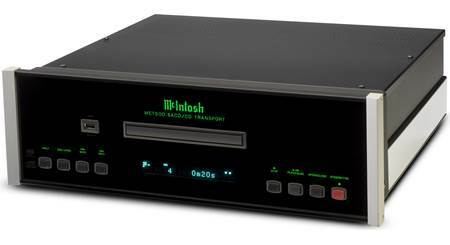 The McIntosh MCT500 disc transport offers a level of accurate digital playback that would have blown my mind then, and still can. It plays SACD, CD, CD-R, and CD-RW, including MP3 and WMA discs — whatever you need it to do — and it has the technology to make them sound amazing. The MCT500's premium die-cast aluminum disc tray and advanced transport mechanism provide fast, quiet, and accurate handling of all your discs. The transport's twin laser optical pickup ensures optimal playback of high-res sources. Audio data is read at twice normal speed to provide better tracking and error correction with damaged CDs and CD-R/RWs. As much as I love the top-notch electronics inside, I must confess I love the way McIntosh components look, too. The entire unit is housed in a classic polished stainless steel chassis with a black glass front panel and brushed aluminum end caps. The softly illuminated black glass front panel, brushed aluminum end caps, and two-tone stainless steel chassis give the MCT500 a classic McIntosh look. optical and coaxial digital audio outputs: Use these outputs for playing your CDs through a component with matching inputs, like the McIntosh MAC7200 stereo receiver or MA5300 integrated amplifier. XLR digital balanced audio output: This high-quality output is designed for sending CD sound to components with a matching digital XLR input. DIN digital audio output: This specialized output feeds both CD (PCM) and SACD (DSD) digital audio signals from the MCT500 to compatible McIntosh preamps like the C47 analog and digital preamplifier and D150 digital preamplifier, for ultra-high-performance decoding. Who can afford to spend this much on a cd transport? It's likely the last transport you'll ever need to own. And a decade later you'll find its still worth more than what most competitors sell their products for new. 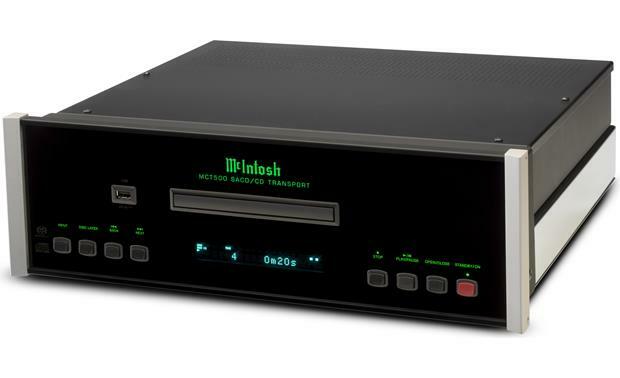 McIntosh Classic Design: The CD/SACD transport is housed in a classic McIntosh styled, polished stainless steel chassis with a black glass front-panel and brushed aluminum end caps. Twin Laser Pickup: The McIntosh MCT500 incorporates two laser elements, with different wavelengths, that are focused through one lens assembly. This unique design allows reading both the CD and Super Audio Compact Disc (SACD) discs formats. 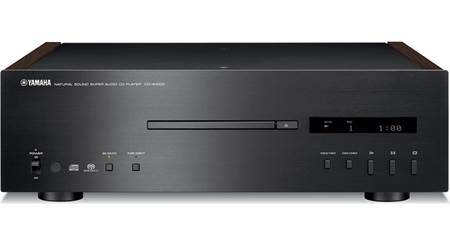 The MCT500 supports playback of CD-Audio and SACD discs. In addition to store bought CDs and SACDs, popular file formats such as AAC, AIFF, ALAC, DSD (up to DSD128), FLAC, MP3, WAV (up to 24-bit/192kHz) and WMA can be played from CD-R/R, DVD-R/RW, and DVD+R/RW discs. Advanced Transport: The MCT500 has a newly designed transport with a die-cast tray. Its premium aluminum die cast CD tray provides the best handling of music discs. It has the latest in advanced digital servo for faster, quieter and accurate operation. The disc audio data is read at twice the normal rate insuring better disc tracking and error correction processing. Front-Panel USB Port: In addition to a CD/SACD transport, the MCT500 is equipped with a front-panel USB-A port for playback of a variety of compressed and high resolution music files stored on a USB thumbdrive or other type of USB MSC (mass storage class) device. Compatible music files include AAC, AIFF, ALAC, DSD (up to DSD128), FLAC, MP3, WAV (up to 24-bit/192kHz) and WMA. 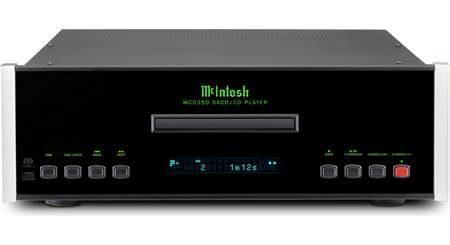 Compatible Music Files: The McIntosh MCT500 supports the following music files via CD-R/RW, DVD-R/RW, and USB MSC. 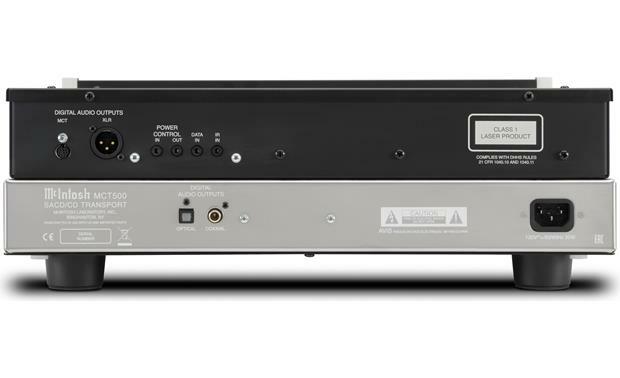 Digital Outputs: Digital balanced, coaxial, optical and DIN outputs are available, giving you flexibility in connecting the MCT500 to the rest of your system; this includes home theater processors, integrated amplifiers, and preamplifiers. XLR (AES/EBU): The XLR (AES/EBU) digital output supports 2ch stereo PCM audio signals up to 24-bit/192kHz. Balanced connections guard against induced noise and allow long cable runs without compromising sound quality. Optical: The optical (toslink) digital output supports 2ch stereo PCM audio signals up to 24-bit/192kHz. Coaxial: The coaxial (RCA) digital output supports 2ch stereo PCM audio signals up to 24-bit/192kHz. 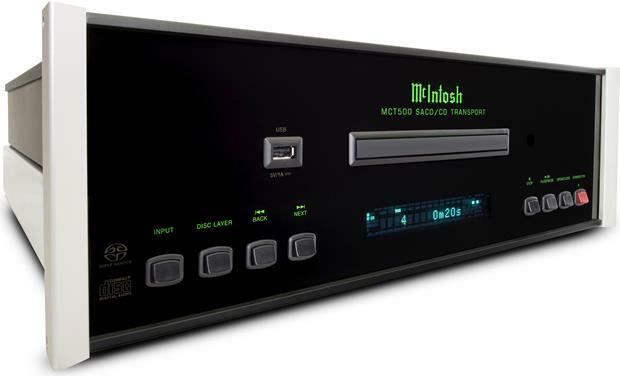 MCT (McIntosh Only): The unique MCT output connects to select McIntosh models with a DIN input (like the C47 or D150 preamps) for the purest possible sound quality, supporting CD-Audio (up to 24-bit/96kHz) & DSD128 (SACD or Data DVD) audio. The MCT500 includes the needed DIN cable. Note: The MCT500 CD/SACD transport contains no analog outputs. Front-Panel & Remote Control: Front-panel controls include Track & Level rotary knobs, as well as the following push-button controls - Standby/On, Open/Close, Play/Pause, Stop, Disc Layer, Previous/Next Track, & Time. The included IR remote control with illuminated push-buttons provides complete wireless operation of the MCT500 's functions. Front-Panel Display: The MCT500 's front-panel display indicates the current disc playback status, including elapsed time, remaining time, and total time. Custom Integration: The McIntosh MCT500 offers advanced connectivity and control features often required for custom home integration. Power Control: The MCT500 has the ability to automatically switch power on or off to and from source components via the Power Control In/Out connections (3.5mm). Data Port: The MCT500 's Data Out Port (3.5mm) sends remote control signals to a McIntosh source component. This Data Port connection allows for the remote operation of basic functions using the MCT500 's remote control. IR Input: The 3.5mm IR input allows the connection of an external IR receiver. With an external sensor connected to the MCT500 , remote control operation of the system is possible from another room and/or when the MCT500 is located in a cabinet with the doors closed. The signal from a connected external IR receiver will have priority over the signal from the unit's front-panel IR sensor. Linear Power Supply: The linear power supply has both a special R-Core power transformer and multiple regulators to ensure stable noise free operation even though the power line varies. AC Power Cord + Auto Power Off: The McIntosh MCT500 features a detachable AC power cord with 3-pole IEC connector. The MCT500 incorporates an Auto Off feature, which automatically places the CD/SACD transport into the Power Saving Standby/Off Mode after approximately 30 minutes of inactivity or no audio signal. Mounting Options: The McIntosh MCT500 can be placed upright on a table or shelf, standing on its four feet. It also can be custom installed in a piece of furniture or cabinet of your choice. The four feet may be removed from the bottom of the MCT500 when it is custom installed. Always provide adequate ventilation for your MCT500 . Allow at least 2" above the top, 2" below the bottom, and 1" on each side of the CD/SACD transport, so that airflow is not obstructed. 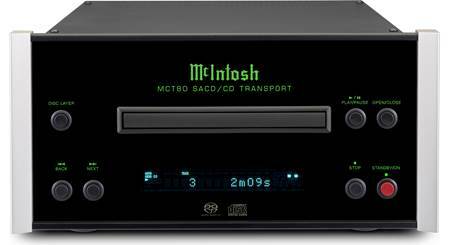 Searches related to the McIntosh MCT500 Stereo SACD/CD transport (no DAC onboard).